As Scotch whisky increasingly falls from favour in South Korea, distillers are searching for new ways to win over consumers – including low-strength products and radical changes to packaging. Richard Woodard investigates. A decade ago, South Korea was deeply in love with Scotch whisky. In the hostess bars and KTV parlours, in the pre-crisis days when expense accounts were generous and corporate entertainment lavish, the rooms echoed with cries of ‘Konbae!’ as businessmen combined their thirst for Scotch and beer by drinking copious amounts of ‘poktanju’ or boilermakers – a shot of Scotch dropped into a beer. Much has changed since those decadent days, when the big names on every serious Korean drinker’s lips were Ballantine’s (especially 17-year-old), and local Scotch brands Windsor (owned by Diageo), Imperial (Chivas Brothers/Pernod Ricard) and Scotch Blue (local company Lotte). The economic crisis of 2008-9 delivered a huge blow to the market, but deeper changes were coming to Korea’s drinking culture before the collapse of Lehman Brothers. Even as the businessmen toasted Korea’s ageing tiger economy, younger consumers were moving in a different direction, put off by the cost of Scotch, and its image as a drink of the older generation. Beer and white spirits – vodka especially – were cheaper and sexier. Korea’s ‘Traditional On-Trade’, or TOT, was by now in decline too, as companies slimmed down expense accounts and reined in corporate entertainment, with public sector employees under much stricter controls (a precursor of what was to happen, for different reasons, in China post-2012). In the new, modern clubs and bars, younger people drank beer, soju and vodka, but were also more mindful of living a healthier lifestyle – a mentality encapsulated by the government’s ‘119’ campaign: one drink, one venue, 9pm. In 2011, 31.4m bottles of Scotch whisky were shipped to Korea (Scotch Whisky Association figures), with a value of £142.6m; by 2015, the market had shrunk to 17.5m bottles, worth just under £100m. In the first six months of 2016, shipments fell again – 13% by volume to just 7.5m bottles, and 17% by value to £42m. Over the longer timescale, sales of Windsor, Imperial, Scotch Blue and Ballantine’s have reduced broadly in line with those trends. As the big hitters of Scotch – Diageo and Pernod Ricard – pondered how to respond, a new local brand, Golden Blue, stole a march by launching a ‘super-premium whisky’ bottled at 36.5% abv, tapping into the trend for lower-strength spirits. 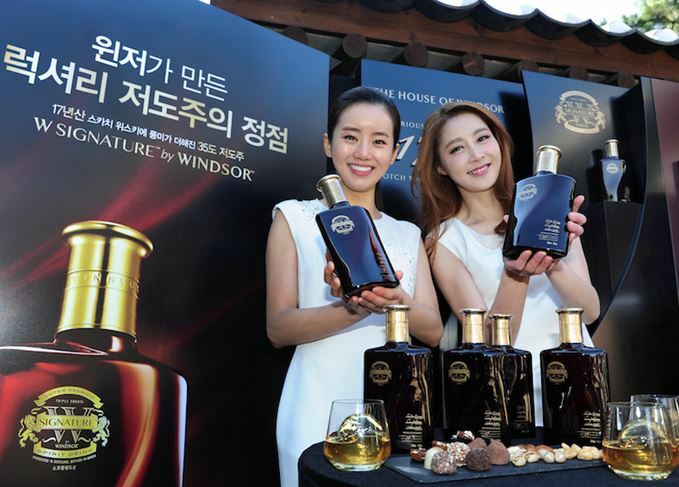 This has become the new template for the Korean Scotch market – but the products aiming to hitch a ride on Golden Blue’s success aren’t Scotch whisky at all, which has to be bottled at a minimum strength of 40% abv. This requirement was reinforced locally by the signing of a free trade agreement between Korea and the European Union in 2011. Diageo was the first to jump aboard the new trend, launching W Ice by Windsor in March last year: a 35% abv ‘spirit drink’ combining blended Scotch with dates and dried fig essence. Since then, it has tried to build on W Ice’s early success with two more launches: W Rare in November last year, and W Signature by Windsor this November – unveiled amid much fanfare at former President Yun Posun’s house in Seoul. Signature’s label clearly states its ‘spirit drink’ identity, and the abv of 35% is in line with current tastes, but everything else about the product screams prestige Scotch: the bottle, the key ‘17’ age statement, the signatures of not one but three master blenders (Douglas Murray, Craig Wallace, Caroline Martin) on the label. Even the price is in line with Windsor’s core 17-year-old blended Scotch product (by a quirk of local law, Signature is taxed as whisky, even though it can’t be called that). Perhaps that’s hardly surprising, given that Signature is 99.9% 17-year-old Scotch, with the balance made up by ‘aroma and flavours’, and water. This is, if you like, the Scotch that dare not – legally cannot – speak its name; or, put another way, the non-Scotch whisky product designed to breathe new life into the category it technically does not inhabit. A Korean take on the ‘flavoured whisky’ trend that has spawned Jack Daniel’s Tennessee Honey on the other side of the world. By contrast, Chivas Brothers has responded (rather late) to the changing trends in Korea with a notably female-targeted piece of new product development, launching Eclat by Imperial in July last year – a 31% offering with packaging seen more often in the perfume section than the drinks aisle. The momentum in this ‘low-strength whisky’ niche is clearly growing: low-abv products had a 17.4% share of Korea’s total whisky market in fiscal 2015, according to figures quoted by Diageo – but that figure has leapt to 36.9% in the current financial year. Looking to the future, Scots will look to the small, but increasingly influential, single malts category as the main source of long-term interest in the years ahead. Historically, Koreans have been – and mainly still are – lovers of blended Scotch and, even though the single malts segment is expanding healthily, it still accounts for less than 5% of Scotch sales in the country. In the future, it may well be that Macallan and Glenfiddich will be the standard-bearers for a new era for Scotch whisky in Korea as consumers are turned on to single malts. For the moment, however, distillers are having to come up with somewhat more creative solutions to Korea’s changing attitude to drinking spirits. Youth meets maturity with Benromach, Glengoyne, Glenlossie, Glenrothes, Imperial and Tullibardine. Grains are a go-go this week, with whiskies from Invergordon, North British and Caledonian.